The Nile is the only traditional Egyptian Zodiac Sign that is neither a god nor a goddess. Characteristics of the Egyptian Zodiac Sign the Nile: If your sign is the Nile, you enrich the world around you. You are ruled by your passions and your constantly changing moods. You are capable of being the nicest, gentlest person, sheltering those around you one moment, and being wild, impulsive, and domineering the next. You are very wise and giving, with a strong desire to help others flourish and to live peacefully. You are very observant of what goes on around you. 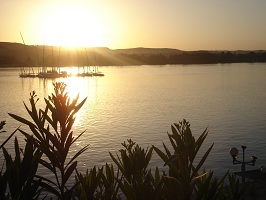 About the Nile: The Nile made life possible for the Ancient Egyptians. It's generosity led to the birth of the Ancient Egyptian civilization. It gave the Ancient Egyptians rich minerals, papyrus, reeds, millet, flax, transportation, and more. All major cities grew along the Nile. The Nile played an important role in Ancient Egyptian religion and mythology. The god Hapy (Hapi) personified the Nile. He and the pharaoh were thought to control the Nile's floods. Together, they could control whether Egypt prospered or perished. The Ancient Egyptian calendar was divided into three seasons based on the flooding of the Nile – inundation season, growing season, and drought or harvest season. With most Egyptians working as farmers, the Nile played a key role in their lives. During inundation season, the Nile's floods deposited valuable minerals that nourished crops during growing season and brought prosperity during the harvest season.